This week on Exclaim! TV, we have something for everyone, from soothing indie pop melodies to the mind-expanding dupstep of a rising duo. Here are just a few of the highlights. 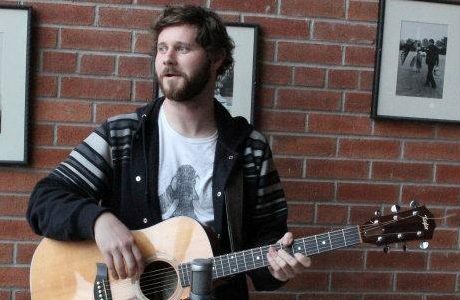 First up, we have much-loved Canadian songsmith/funny man Dan Mangan (pictured) playing "Leaves, Trees, Forest" and "About As Helpful As You Can Be Without Being Any Help At All" off his Oh Fortune, an album that came at No. 2 on our recently published best folk & country albums of 2011 list. As an added bonus, you can download MP3s of the solo acoustic performances, in addition to watching Mangan get all tender and emotional on us. Then we have Saskatchewan's Library Voices, who also gave Exclaim! TV some acoustic performances. With their many instruments, the group of friends filled Toronto's Cardinal Skate Co. to play "Generation Handclap" and "Be My Juliette Greco, Paris 1949" from their most recent album Summer of Lust. And finally, check out our interview with the up-and-coming electronic band Dr. Ozi. Exclaim! also brings you a look into their wild Bassmentality concert that went down this past fall. Of course, keep an eye on Exclaim! TV for more upcoming exclusive interviews and performances.